Trees on your property can provide plenty of shade and protection, but as they grow, trees need to be professionally trimmed. Tree trimming not only allows sunlight to reach your lawn and other plant material, it also helps trees grow correctly, and live longer. At Porter Tree Services, we are experts in tree trimming. Before we begin a project, we will meet with you and inspect the trees in need of service. This allows our experts to determine the scope of the project, and answer any questions you may have. The tree trimming services we provide will remove damaged and unhealthy limbs from trees on your property. We can also prune branches that are close to buildings and homes; this reduces the chances of damage caused during periods of high winds and strong storms. A benefit to tree trimming is its impact on the overall health of other plant material and turf. Removing the correct branches allows for more sunlight and air circulation helping plants and grass to thrive. Severe weather can often lead to falling branches. These branches can adversely affect the trunk of the tree and the remaining healthy branches. If not removed, these falling branches can even contribute to the early death of an otherwise healthy tree. 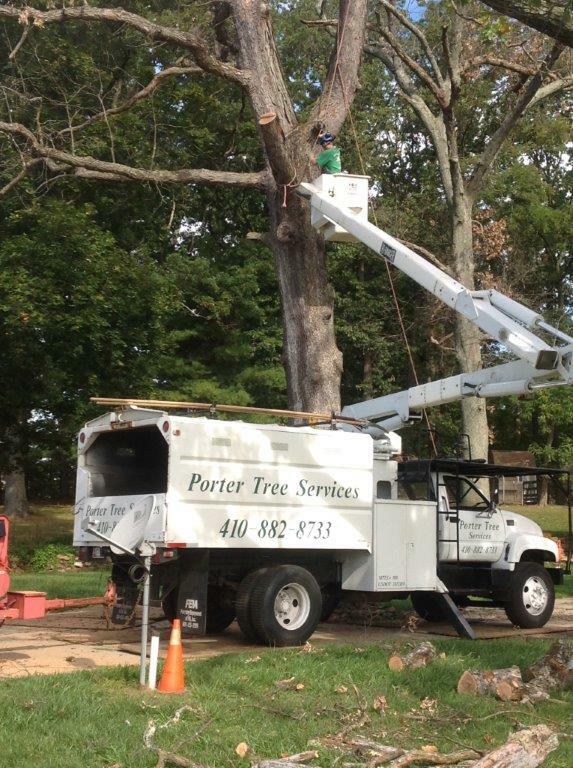 Porter Tree Services can address your trimming needs to avoid the dangers inherent in falling branches and to help maintain the overall health of your trees. If the trees on your property are in need of trimming and you want service that is professional, thorough and responsive, contact the professionals at Porter Tree Services. We will bring our experience, our highly trained employees, and our excellence of service to you. If you have questions about our tree trimming services, or would like to schedule a site visit, please call us today at 410-882-TREE (8733).